Butter a 9-inch fluted tart pan with a removable bottom. Press the dough evenly over the bottom and up the sides of the pan, using all but a little piece of dough, which you should save in the refrigerator to patch up any cracks after the crust is baked. Place the crust on a baking sheet and freeze for at least 45 minutes, preferably longer, before baking. Place a rack in the center of the oven and preheat to 375º F. Butter the shiny side of a sheet of aluminum foil and fit the foil buttered side down, tightly against the crust. (Since the crust was frozen, it can be baked without pie weights.) Bake the crust for 25 minutes. Carefully remove the foil. If the crust had puffed, press it down gently with the back of a spoon. Patch the crust if necessary, then transfer to a wire rack to cool completely. Place a rack in the center of the oven and preheat to 350º F. Line a baking sheet with parchment or a silicone mat. Fill the cooled crust with the almond cream, spreading evenly with an offset spatula. Remove the pears from the liquid and pat dry with paper towels. Place a pear halve on a large flat plastic spatula (not one you would use for folding and scraping) and thinly slice the pear crosswise. Using the spatula, transfer the sliced pear to the tart (wide end toward the edge of the crust) and press down on the pear to fan it slightly over the almond cream. Repeat with the remaining pears. Transfer the tart to the prepared baking sheet. Bake for 50 to 60 minutes, or until the almond cream puffs up around the pears and browns. Transfer the tart to a rack to cool. Serve while slightly warm or at room temperature. 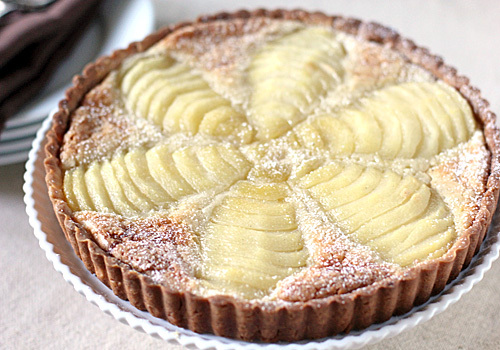 Right before serving, dust the tart with confectioners' sugar. Enjoy!